Catalan newspaper Mundo Deportivo believe they know Barcelona’s preseason schedule for the summer, and it includes a match against Tottenham Hotspur. 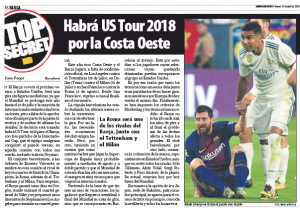 In their Tuesday edition the newspaper report in a ‘Top Secret’ section that Barcelona are going to the West Coast of the US for preseason and will face Tottenham, AS Roma and AC Milan. Despite the ‘absence of official confirmation’, Mundo Deportivo feel confident enough to name the dates and locations of Barcelona matches, as well as the opponents. It’ll be part of the International Cup, which would suggest Tottenham would be playing against others taking part in the US section of the competition, and it be split into two or more groups like last year. Last summer Tottenham faced PSG, Manchester City and Roma in the US section of the competition. It may not be a full strength squad for any of those involved, with the World Cup finishing on July 15th, players will be given holiday before joining up. 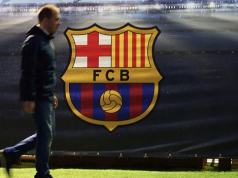 Depending on how far internationals go in the tournament, it’s unlikely many would be available for the first couple of matches which Mundo Deportivo believe Barcelona have scheduled. If the claims are correct, it’s certainly an interesting and competitive preseason selection for Tottenham.